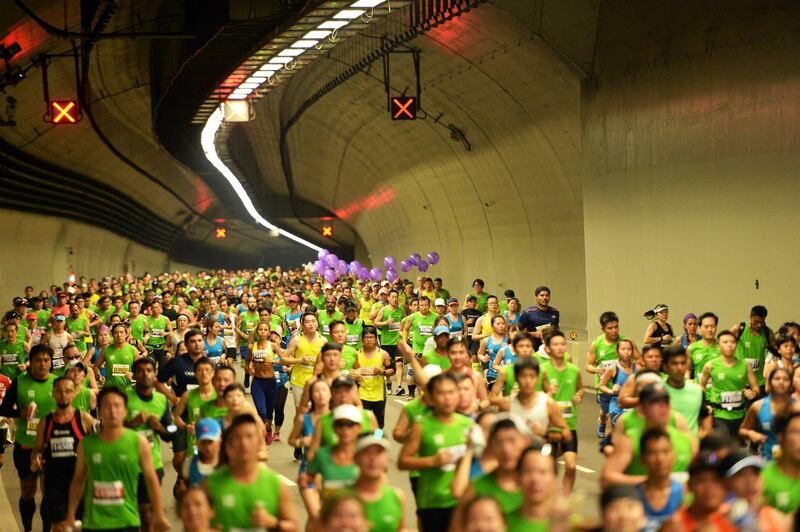 The Singapore Marathon is an annual international marathon race which is held in December in the city of Singapore. It is an IAAF Gold Label Road Race. It has grown significantly since its inaugural race in 1982 – the 2013 event attracted a total of 60,000 entrants for all categories. There are four separate categories of competition: the full marathon, the half marathon, the 10 kilometres run, and the 10 km wheelchair race. Furthermore, 10 km team competitions as well as a number of short running competitions for children. Prize money for the full marathon race is divided into three categories: the open prize (for all competitors), the Singapore prize (open to national competitors), and the veteran prize (which acts as a masters competition). 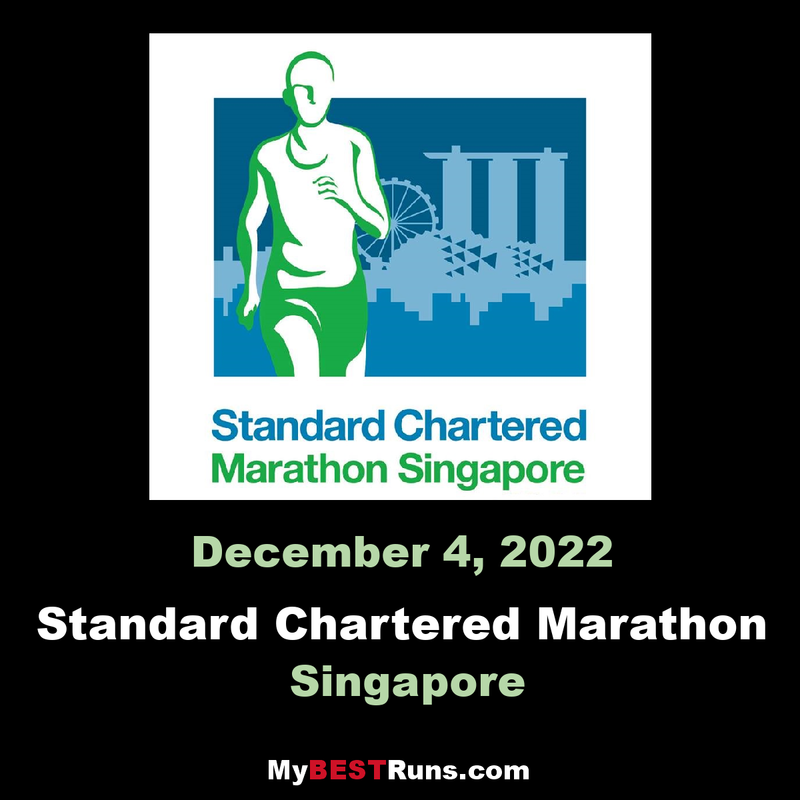 Between 2004 and 2008, it was part of "The Greatest Race on Earth" series of road races, sponsored by Standard Chartered Bank (the other three legs being the Hong Kong Marathon, Mumbai Marathon and Nairobi Marathon). The times recorded at the Singapore Marathon tend to be slower than those at other marathons as Singapore's climate is usually hot and humid. Kenyans Luke Kibet and Salina Kosgei are the men's and women's course record holders, respectively. The 2006 edition also acted as the country's national championships, with Elangovan Ganesan and Vivian Tan Yoke Pin taking the honours. (2017 Race report from IAAF) It may have been one of the slowest marathons of her burgeoning career, but Pamela Rotich’s 2:38:31 triumph at the Standard Chartered Singapore Marathon on Sunday (3) was her first victory at an IAAF Gold Label event. Compatriot Cosmas Kimutai made it a Kenyan double – the seventh in the past eight editions – by winning the men’s race in 2:22:48 in what was his first race for three years. The race, despite starting at 4:30am, still couldn’t escape the 28C heat, so times were understandably affected, as is often the case in Singapore. The opening pace wasn’t significantly fast with the lead women going through 10 kilometres in 36:11. There were seven women still out in front as they reached the half-way mark in 1:19:52. Kenya’s Rebecca Korir and Peninah Kigen were the first to drop back, but compatriots and namesakes Rebecca Kangogo Chesir and Peninah Arusei still featured in the lead pack alongside Rotich and Ethiopia’s Chaltu Waka. The remaining quartet reached 25 kilometres in 1:34:04. Within the space of five kilometres, the lead pack had been reduced to two women as Rotich and defending champion Chesir passed 30 kilometres in 1:51:51 and 35 kilometres in 2:10:17. Chesir was unable to hold on for much longer, though, and Rotich finally broke away from her opponent with just five kilometres remaining. Rotich reached the finish line in 2:38:31, the fastest winning time in Singapore since 2012. Although nearly 10 minutes shy of the 2:27:48 personal best she set when winning in Daegu earlier this year, Rotich achieved her ninth successive podium finish in an international marathon. Chesir completed the race four minutes quicker than her 2:43:04 winning time from last year, but on this occasion had to settle for second place in 2:38:48. Arusei finished third in 2:39:07. Cosmas Koech Kimutai hadn’t been considered one of the pre-race favourites for the Singapore Marathon. Not only had he not raced at all since 2014, but he set his PB back in 2010. And even then, his 2:09:25 best was only the eighth fastest among the elite entrants. It would have taken a brave person to bet on him. The opening pace in the men’s race was even more cautious, relatively speaking, than in the women’s. With no one willing to make an early move in the tough conditions, a large lead pack passed through half way in 1:12:00, making it clear that today wasn’t a day to challenge the course record of 2:11:25. Ten men were still in contention at 30 kilometres, reached in 1:43:11. Kimutai still featured in the lead pack alongside fellow Kenyans Justus Kimutai, Eliud Tarus, Paul Matheka and veteran Mark Kiptoo, the fastest entrant. With a quarter of the race left, Kimutai made his move and by 35 kilometres had opened up a nine-second gap on Matheka and 2012 Singapore Marathon winner Kennedy Lilan. A 15:55 split between 35 and 40 kilometres meant that Kimutai had increased his lead to 26 seconds with just two kilometres remaining. He held on to his lead and won comfortably in 2:22:48. Justus Kimutai finished strongly to overtake Matheka in the closing stages and take second place in 2:23:07. Matheka finished third in 2:23:25, 16 seconds ahead of Kiptoo.